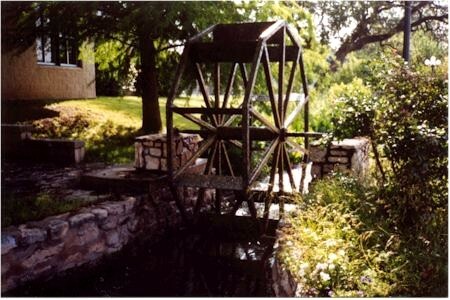 A decorative water wheel representing the gristmill once powered by "The Ditch"
"The Ditch" has been in continuous use for irrigation for more than 100 years. ;;In 1986 as part of the Texas Sesquicentennial Celebration the local residents decided to create a "Ditch Walk" along the irrigation ditch that ran through town. A sidewalk, a park bench here and there, a decorative water wheel to represent the grist mill once powered by the ditch and there you have it. The "Ditch Walk"!! The day we visited (early Spring 2001) the walk was a little thread bare. I'm sure that early in the spring the local ladies of the Garden Club had not made it to the walk yet. I'm sure they will. 18-Jan-2007 - The Vintage Gas Station is in much worse shape than before. I hope the good folks of Menard save this structure. 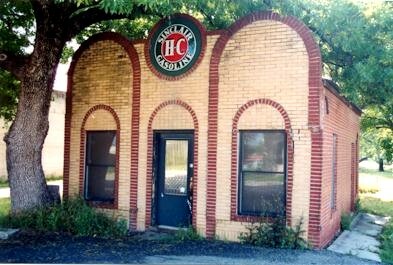 The Vaughn Agricultural and Mechanical Canal Company was chartered in 1874 by William J. Vaughn, President William Tipton, Director and James H. Comstock, Director and Secretary. Major H. M. Holmes was appointed attorney. 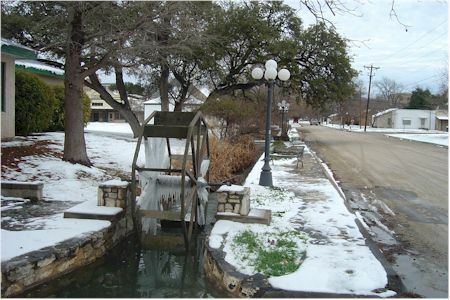 Irrigation for 200 acres of valley land and power for gristmills are furnished by gravity flow from the San Saba River. Use of "The Ditch", running from 5 miles above town to 5 below, began in 1876. Vaughn sold his controlling interest to Gus Noyles in 1886. 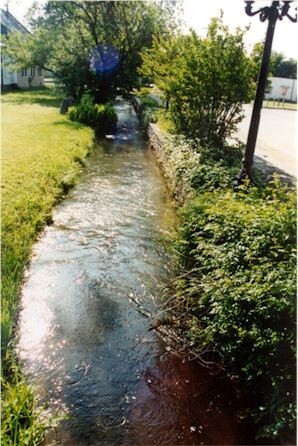 Since 1905 "The Ditch" has been operated by Menard Irrigation Company, using the original dam. The San Antonio the River Walk runs by the cradle of Texas Independence "The Alamo". At the Menard "Ditch Walk" you can see this 1930's vintage gas station. It may well represent an industry that maintained Texas financial independence.